🙏【Satisfaction Guaranteed】 - The Power Fryer conforms to FDA, CSA, ETL, UL, CA Prop65, VDE Certified Safe and Free of PFOAs. We offer a 60-day money back guarantee if you are not satisfied with your healthy fryer. Purchase the Kitchen Academy Air Cooker XL with confidence and effortlessly fry, grill, bake and roast delicious food for you and the family! 1. Please kindly read the user manual before using the appliance. Keep the manual for future reference. 2.Preheat the Air Fryer for 3 minutes. It is necessary for the Air Fryer to reach the desired temperature. 3. When making smaller items such as fries, wings, and croquettes, shake the basket once or twice during cooking to make sure food is cooked evenly. 4. You can adjust the time and temperature according to your preference. The cooking time of the recipe is only for reference. 5. Do not cover the air inlet and outlet when the appliance is in operating to avoid accidental burns. 6. It is recommended to dry the frying basket and pan after cleaning. 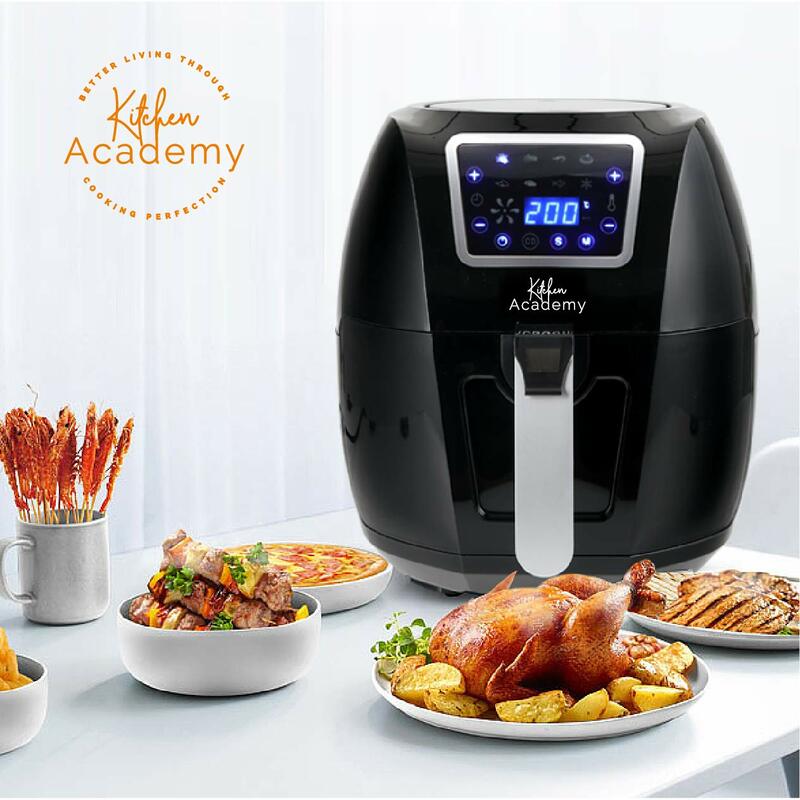 The Kitchen Academy Air Fryer, also known as Healthy Fryer, Mini Oven, No oil Fryer and it uses air circulating technology to cook food with little or no oil necessary. It's a perfect choice for healthy eating, organic eating, and eating fresher food. Product Size: 13.3 x 12 x 12.4 inch.